IMPORTANT: Isabela II cruises must be reserved over the phone. Call us for more information. Guests cruising on Isabela II get the full Galapagos Island experience. Sailing year-round in the Galapagos, Isabela II offers one of the most in depth experiences available. This cruise is perfect for nature lovers from all around the world. Every cruise on Isabela II features numerous experts to help enhance each voyage. These include lectures by local experts, tours by local guides, and even hands on demonstrations of local customs and traditions. A cruise on Isabela II is truly a learning cruise. With such a small size, Isabela II carries only 42 passengers, guarantees personalized service. Whether it be a cocktail waiter making sure you glass is always full or one of the chefs preparing a unique meal for your individual palate, guests will feel the greatest sense of relaxation and comfort possible when onboard. Just because you are in the exotic Galapagos does not mean you must sacrifice the creature comforts of home. 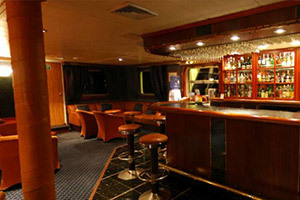 Onboard you will find a full service saloon and bar where you can enjoy your favorite cocktail. Expert chefs will bring high quality dishes to your table every night. 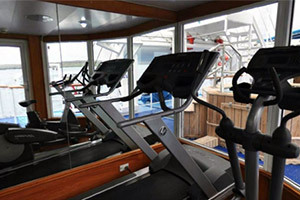 There is even a fitness center to keep your body going if the nature adventures aren't enough and if you had enough exercise for one day, spend the evening relaxing in the jacuzzi. Every cruise on Isabela II features an expert naturalist. It is their job to make sure that passengers get a full in-depth Galapagos Island experience. They will provide nightly lectures onboard and even guide walks on shore. For adventure seekers who wish to get more out of their Galapagos experience there is snorkeling equipment available onboard. Guests can dive and explore the many natural reefs and sea life located all around the Galapagos Islands. Huge Discounts & Low Price Guarantee on all Isabela II Cruises! Book any Isabela II cruise with us and you'll get the best deal possible, regardless of the ship or sail date! Because of our huge price discounts and "Low Price Guarantee," nobody beats our Isabela II cruise prices, so look around and you're sure to find the best Isabela II cruise deal possible when booking with us! We do not charge booking fees on any cruises! You're sure to enjoy an affordable Isabela II cruise when booking with us! Our special offers on Isabela II cruises may not be combinable. Certain restrictions apply to each offer. View terms and conditions during the online booking process. All staterooms on Isabela II feature the same layout. They include a shower, toilet, sink, bed and a small window. The deck plans of Isabela II provided on this page are subject to change. We reserve the right to correct errors. Please verify all information with Avalon Waterways directly.